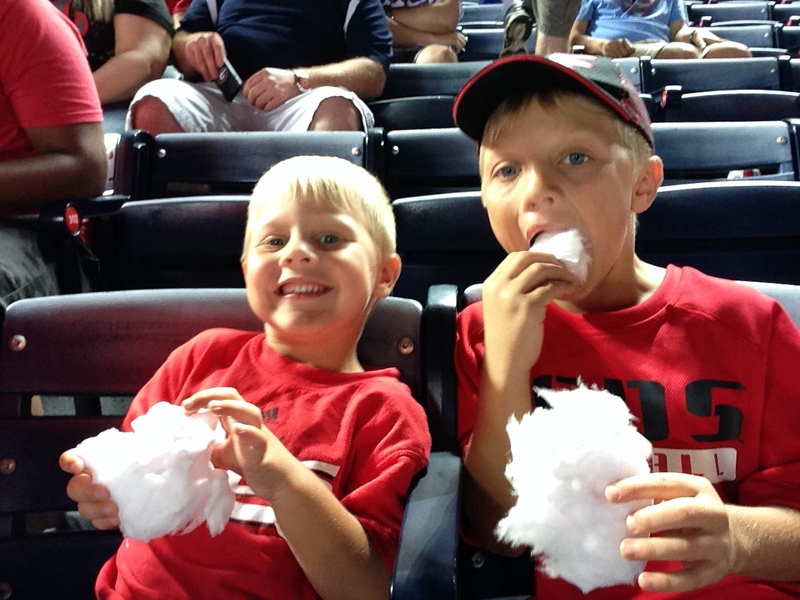 A couple of weeks ago, I took my 2 oldest boys, to Atlanta for a weekend of baseball, barbecue, and bonding. My wife and I discussed this opportunity several months ago, and we intentionally set aside time, money, and resources to further my relationship with my boys. It was an incredible experience! After driving 8.5 hours we went to a baseball game Friday night, hung out at the hotel pool on Saturday, watched Captain America 2, and went to another game on Sunday afternoon. On Saturday evening went to Fox Bros Barbecue, one of the highest rated barbecue joints in America. We were able to let loose the entire weekend. Music was blaring in the car every chance we got. More important than any activity we did or restaurant we ate at was the memories that will last a lifetime. We intentionally had conversations with people at the baseball field, a homeless man outside of the hotel, our waitress at the barbecue restaurant, and the front desk employee at the hotel. Our laughter was contagious throughout the entire trip! Whether it was in the car, the hotel room, or around the pool, my two boys laughed nonstop all weekend. Even shortly after Elijah got a little bothered by the hot sun during Sunday’s game, he saw the crazy mascots running around the field and laughed hysterically. I realized the importance of letting loose with my boys and showing them what it looks like to experience an exciting, memorable moment! My boys know how to ask questions! Are we there yet? Why are we not there yet? When are we going to be there? What type of cows are those? Why is that building so tall? How did he miss that ball? How was that not a strike? What is that person eating? Why are they yelling at the umpires? But the one that struck me the most was… Why doesn’t that man have a home? Whether or not they are intentional, my boys look at me as a wealth of information, knowledge, and wisdom! It made me think – what am I filling their minds with? 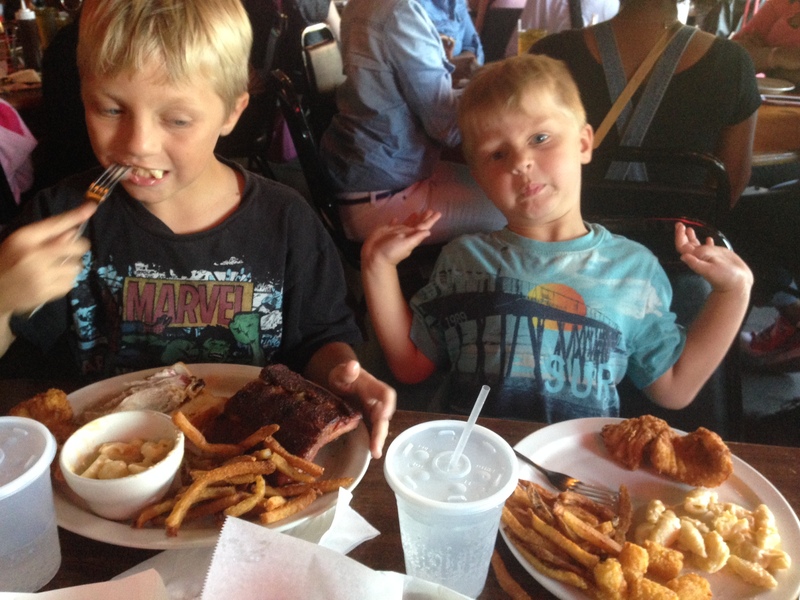 I do not want to brainwash my boys (unless it is about creepy county fairs or cheap all-you-can-eat buffets), but I do desire to raise them in the admonition of the Lord! Am I filling their minds with Scripture? Am I living a life that they would want to imitate? This weekend made me realize the responsibility God has placed before me! Whether good or bad, I am setting an example to my boys of how I think they should live. How I treat my wife will affect how they treat their future spouse. How I view God will impact their personal relationship with the Father. How I react to circumstances will influence my boys’ reactive responses to issues they face. As a father, there is a huge weight on my shoulders to live a life worth imitating for the cause of Christ! Fortunately, I have a Heavenly Father who walks me through every step of my life. He has provided the greatest example of what it looks like to be a father of grace, love, forgiveness, and truth! I pray my boys experience those same characteristics in and through the legacy I am leaving them! Speak words of affirmation & self-worth – Our kids need to hear words of encouragement, love, and grace. We must use our words wisely as we live out the responsibilities of parenthood. So much of culture preaches and teaches that affirmation and worth are found in success and relationships. 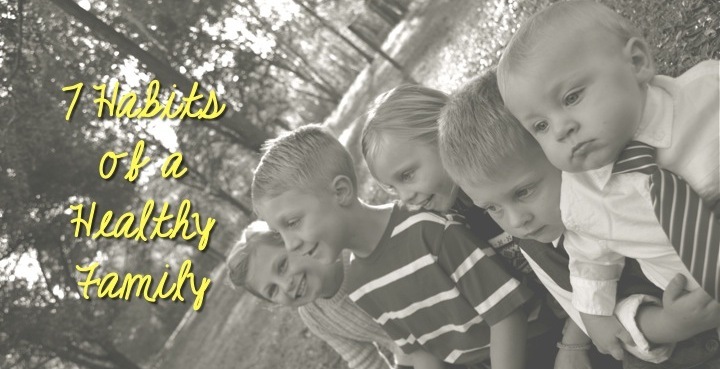 Our kids need to know that they are God’s creation, made in His image, and designed to bring Him honor and glory. They do not need to accomplish a list of 100 things to obtain God’s love. It is available to anybody who believes in Him! I have seen so many teenage girls run to a relationship to experience love and self-worth. 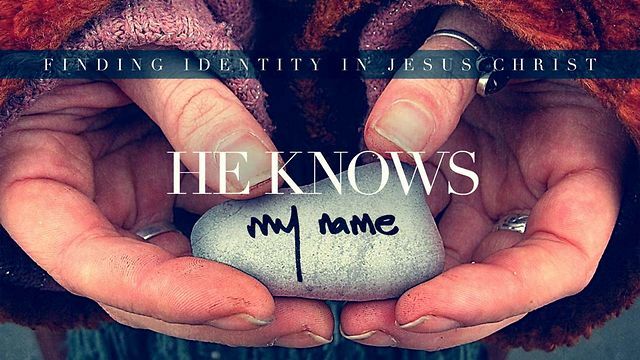 What are we doing to establish a life of worthiness in a relationship with Christ? Are you speaking words of defamation or words of affirmation? Establish cultural boundaries – I do not believe that God has called us to seclude ourselves from the entire world. He has not only called us to be in the world, but has also given us the responsibility to reach the world. The Village, one of my favorite movies of all-time, is about a countryside town that isolates itself from the surrounding world. They missed their purpose and placed their identity in their cultural traditions. Within modern Christianity, this can often lead to a legalistic relationship based on rituals, tradition, and rules. It causes us to miss the incredible love, grace, and compassion offered to us in a relationship with Christ! At the same time, I see incredible value in setting boundaries around our kids’ interactions with culture. There are certain shows our children are not allowed to watch. There are certain types of music that we do not listen to. We do not have cable, do not allow our kids to stay the night at a random friend’ house, and do not own a video game system. As our girls get older we will begin working towards a life of modesty and purity, and as our boys mature we will work to impart a life of love and respect. Most importantly, we believe training our children in the admonition of the Lord will help instill an identity in Christ, not culture! Approach the Heart – I wish I could say I have this one mastered! I want my kids to obey and immediately do what I have asked them to do. I often become so focused on the actions and attitudes that I miss the heart! I want my kids to have the knowledge of who God is, but I often skip from their hearts and go straight from the heads to their hands. We cannot miss our kids’ hearts! There is a time and place for discipline and a time and place to approach the actions, but we cannot miss the attitude of the heart. As we accomplish this, their actions will become a representation of their authentic love for God! Romans 5:6-11 – “6 You see, at just the right time, when we were still powerless, Christ died for the ungodly. 7 Very rarely will anyone die for a righteous person, though for a good person someone might possibly dare to die. 8 But God demonstrates his own love for us in this: While we were still sinners, Christ died for us. 9 Since we have now been justified by his blood, how much more shall we be saved from God’s wrath through him! 10 For if, while we were God’s enemies, we were reconciled to him through the death of his Son, how much more, having been reconciled, shall we be saved through his life! 11 Not only is this so, but we also boast in God through our Lord Jesus Christ, through whom we have now received reconciliation.” Are we living out these words of Paul in front of our kids? Do we believe that while ‘we were still powerless, Christ died for’ us? It is only through a relationship with Christ that we can experience true reconciliation! His love is more affirming than any relationship we will ever know. Abiding in Him gives us purpose and worth that goes beyond anything we could ever imagine. Our kids need to hear these words as well! Lead by example and speak life into your children every chance you get!